MORE pellets per shell for MORE trauma-causing power. Ducks and geese won't know what hit 'em! 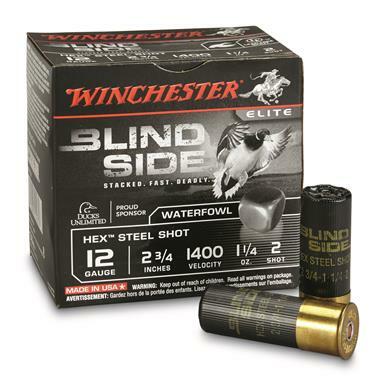 Game-changing hexahedron-shaped pellets crumple waterfowl with a 6-sided punch that cuts through feathers and keeps going. Unlike round shot, HexTM shot focuses energy transfer and concentrates blunt-force trauma with sharp corners and flat sides for massive wound channels and flight-stopping shock. Space-optimizing Hex shot also provides superior packing density by stacking gap-free in the shot cup. These tight-fitting stacks create room for 15% more pellets in every shell and save space for bigger powder charges, providing more velocity. Exclusive Diamond-Cut Wad manages pattern density and uniformity with diamond-shaped air-brake petals for improved downrange performance, stretching the kill zone up to 25% beyond the 30" sweet spot. The hinged wad column also increases velocity while reducing peak pressure and perceived recoil. Re-engineered Drylok Super Steel® system provides water-resistant durability. Made in the USA.